Recently it seems that virtually everytime there's a choice between a bearish count and a bullish count, the bullish count wins. This was once again the case yesterday, as the bulls did what they needed to in order to knockout the bear count (in the Dow, at least). There now appears to be a complete five-wave form on multiple time frames, so it's likely that a correction is due at the minimum. The bears will hold out hope that the recent highs will mark ALL OF wave (v) up, but given the track record of bearish vs. bullish counts, I'm going with the more bullish count as the preferred view, which would see the recent highs as marking wave (1) of (v), with more upside to come. We'll have to watch the decline carefully, and if it seems to be turning into an impulsive form and starts breaking some key trendlines, then we'll consider the more bearish option in greater detail. The bullish Dow triangle count, shown on Sunday, appears to have played out to perfection. Below is the original chart, followed by the updated chart. Again, since the rally has now completed five smaller waves up, there is always the possibility of a larger top in this position. Current expectation is that these five waves are only completing wave (1) up, but any trade beneath the E wave low would be a big red flag to bulls. Barring that, we should probably continue to give the benefit of the doubt to higher prices. 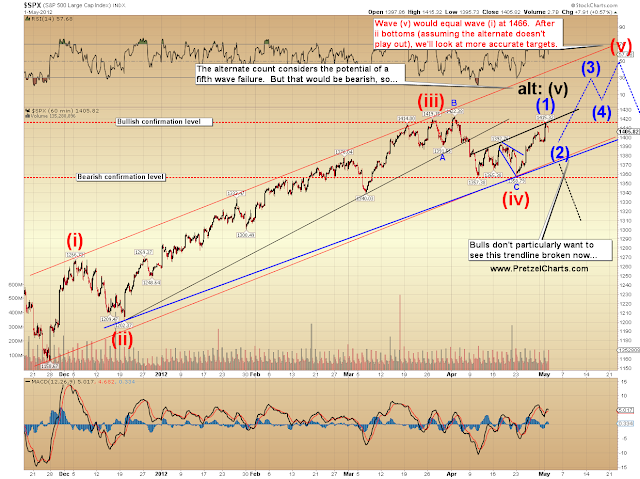 Below is the short-term SPX chart. 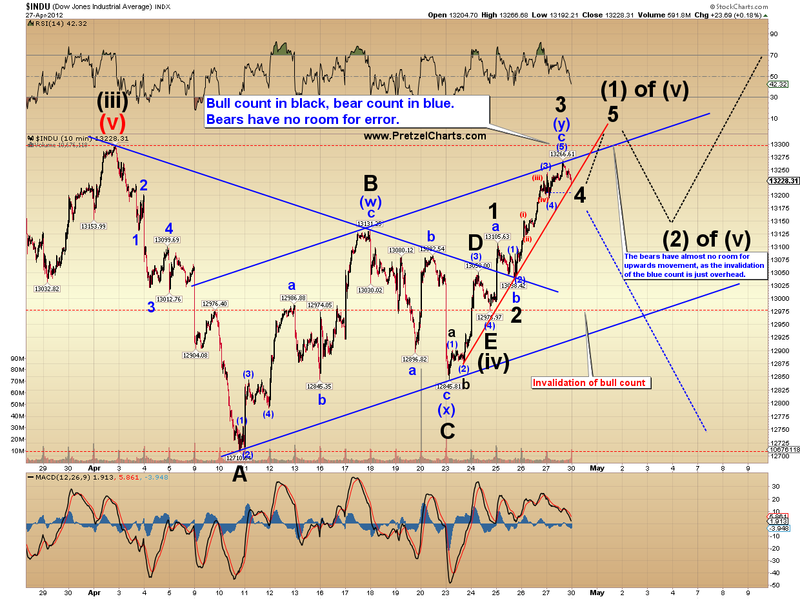 And the bigger picture SPX chart, with an initial target possibility. We'll narrow down targets after the assumed wave (2) bottoms. On a bright note, yesterday's Euro/US dollar call was a big winner, as eur/usd dropped substantially. This is the one thing which is causing me to give some serious consideration to the more bearish alternate count -- the dollar appears to have put in a base and could be due for a lengthy rally. Now, dollar/equities correlations come and go -- however, a bullish dollar indicates that traders view QE3 as significantly lower probability. 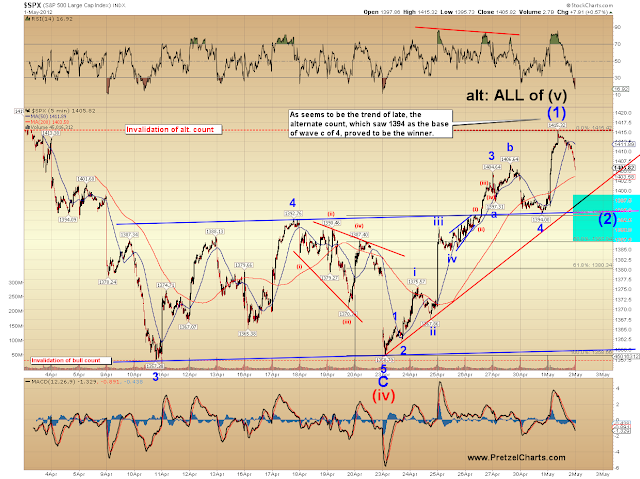 And no QE3 hope is bearish for equities. In conclusion, we'll have to watch this next decline carefully for signs of an impulsive move. If that happens, the possibility of a fifth wave failure will loom large. But if we get a garden-variety scary (to bulls) a-b-c down, which is currently the expectation of the preferred count, then it becomes quite likely that the SPX is on its way into the mid to high 1400's. Trade safe. Good morning. Sorry the update's a bit late, I've been trading the eur/usd like crazy tonight, and over the past few hours have been jumping in and out trying to pick up a few extra pennies while attempting to determine if it's basing ST.
Guten morgen from Muenchen. The market obviously isn't bullish enough and keeps you guessing. Good morning PL.....another stellar-lee objective analysis. Question on commodities: is copper in a 5th wave up within a C wave up from the October lows? If so, could we then trade FCX as a surrogate? potential drop as it breaks thru the ES 90 level, this is the third test of that level (120 chart). developing discipline and patience is tough... every day I gain more appreciation and respect for those of you that this do this for a living. does the 89.25 print matter at all or since it bounced back above 90 is it just another test of the support. does the 80>>120 rule translate to the 10>>15 in the ES and spx? I just ordered the book and look forward to reading it. First I have to get through F&P's book on Wave Principle. I have found it tough sledding & think I'm going to have to read it several times. tough question, all has to come together to support a major move, usually on a third test it breaks. 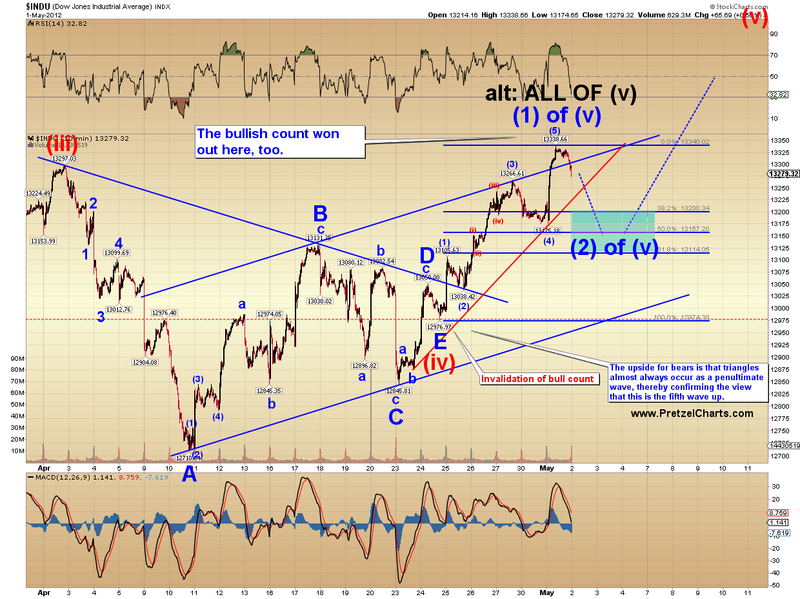 What has to come together is: EW count; indicator candles, timing, important levels. If this broke thru my 80 >> 120 would have gone into play immediately, but it bounced. now we watch and see if 95 holds or not. If 95 breaks it will be a back test of that 98 level. That appears to be an impulse down, and the fact that 1394 was broken is encouraging for bears. 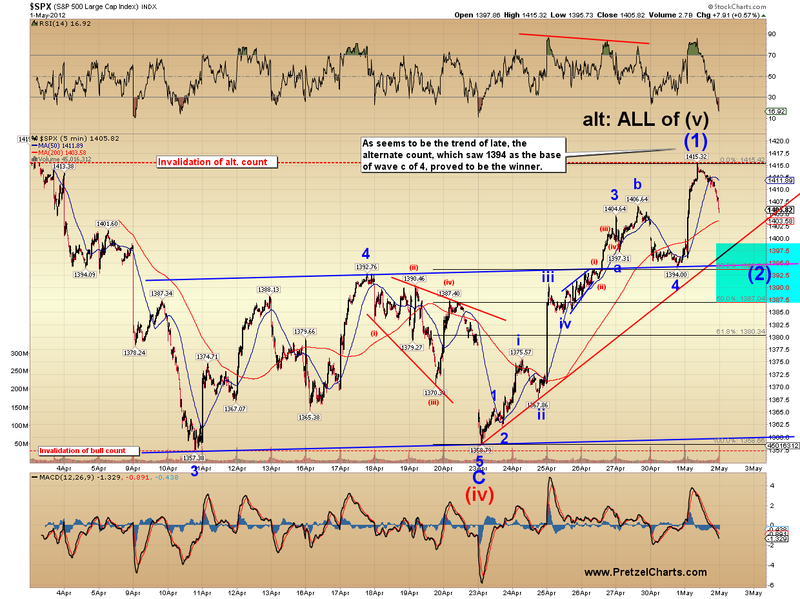 For one, it confirms my view that yesterday was wave 5 up for the larger wave, and not wave 1 of (3) or something. Anyway, "should" be new lows after the bounce is over. Could drop fast if 1393 is broken now. I'd like to see a low below SPY 139.46 to confirm a 5 wave down structure. okay, it appears that it is wearing itself out trying to break the 95 level, have no dog in the fight (money) but looking for a breakdown soon or at some point (within an hour??). it's always hard to tell if it's a complete impulse when there's a big gap. best to read small pieces...then it takes time to let it sink in. definitely don't try to plow right thru the book. Yeah, the gaps make it hard to nail down the ST count. switch to the 5 minute, the 3 minute can work at some points, imo the 5 is better at this time. . . dunno for sure tho. Classic news archive of the day from 2007: "Apple iPhone Will Fail in a Late Defensive Move"
Ye Olde Alchemical-Free Prediction o' the Day...$RUT fills both its gaps and ends at 800ish. 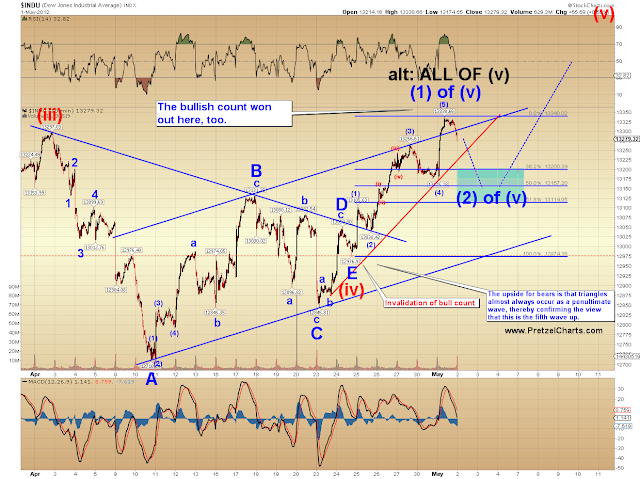 A OF 4 --- OR 1 up off the corrective low?? does this drop change your mind? Just noticed the Nasdaq-100 high on April 12 was almost exactly 50% retrace of 2000 high/2002 low. Any importance in this? Pretzel - would you be interested in providing a long term count encompassing these points? I just wanted to thank you so much for retreating from yesterday's highs...It's really scary up there isn't it. All precarious and stuff. No place for such fine strong animals as yourselves. Just to say "Thank You", I've attached a little video for you to help you have a better, more productive day. I must also note that it is such a nice video that us bears are not allowed to watch it (wink-wink, nudge-nudge). making a 4 wave... or impulsing up?? damn, been watching this for 17 minutes now, cannot watch my charts anymore. good night. I'm more inclined to view it as b (or 2) up. Hello PL.....looking at the auto industry and find Ford has a very interesting pattern since the 2009 lows. Does this look accurate? PL, I haven't even been back to MV since I migrated here. They seem so MSM now! free?? alchemy is the only thing that works! Well, it shouldn't be a-b to A unless you're expecting a flat, which means your projected retrace is too shallow. Otherwise, your current iii is iv and your projected retrace is too deep. I'd have to look at it in more detail later. Feel asleep in my soup......tomato no less! Thanks.....I'll do some fine tuning. Grateful for the analysis.
. . . within 3/4 of an hour we will find out if this is a Swiss chocolate bear or a real one. something may be brewing. . .
break of 95 ES, say 94 for good measure. starts the ball rolling. The number 1385 keeps on coming up all over the various charts I look at, that would be a 100 point drop from here. 10 point drop not 100 right? It gives me the sense that I'm going through a never-ending meat grinder. I kinda got outta there quick. yes, thanks for clarifying. I move back and forth from $INDU to ES, that 100 point drop reference actually would be referencing my 80 >> 120 concept. So that was an $INDU number, sorry. Where/how does he come up with this stuff? Nos must be some kinda human hybrid....5 maybe 6 arms used on 3 computers to search, review and share info with his lesser human kind. I'll bet he doesn't even sleep in a bed...probably standing up, CAT naps. That's great news. I only hit MV about once a week to check up on what Peter Atwater's written. Markets are on a buy signal but struggling. Standing aside. Next s/t high on May 9. Close below 1376 S&P cancels buy. Gold & Silver...waiting, even if there is a buy signal he does not see a big move. Nat Gas....s/t cycle is up. Does not believe we have seen the ultimate low. Look at the 15 ES, put your eSignal count on it, ignore the PTI. I could be wrong tho. Nah...1 laptop, a dozen or so tabs open, a misplaced sense of priorities, and the lack of sleep. Gotta run to a viewing in Philly, an old friend's Dad...a 92 y.o. Chinese immigrant who just wanted his kids to get a good education at any cost, so he came here after retiring from the Royal HK Police. He was a bit of a firebrand himself. Whenever he would greet anyone at the door, he would extend his right hand with a welcoming smile...his left hand would always be behind his back (he had a .38 Special in his left hand.) All his kids turned out great. Productive as all get out....a good guy. Pneumonia got him. We have a saying about pneumonia...we call it "An old man's friend." Might there be worldwide, all encompassing index that is shortable...the whole damned thing...that would be interesting, especially at 3x. from an old b/w movie about linemen. uncanny, what was your clue to it turning there? i was about to go long there, lol. thanks a ton katzo! EW structure, I am not out of the woods yet tho. I will not be around, have meeting in 10 minutes. Get it? Head 'n Shoulders shampoo, a "bob" haircut? Moving right along, great work on CVX, BOB_E, nice learning experience for me. If there were such an index, they'd have to call it the Kali Yuga Index, or KYI. I'd sponsor it. What the heck, we're close to the bottom of that curve anyway! I have some general thoughts that I want to share and get some feedback. The last employment report came in way weaker than expected even though weekly jobless claims, ADP payroll, ISM Manuf., and ISM Non-Manuf. employment figures all pointed to a strong number. Likewise, yesterday's ISM Manufacturing report came in a lot better than expected in comparison to the Chicago PMI and other manufacturing surveys that had been coming in over the month. This month's weekly jobless claims numbers and today's ADP number have come in weaker than expected. Here's the kicker... since these numbers appear to be rigged and defy all logic, what if Friday's job number comes in better than expected AND last month's employment numbers are revised upward? Thanks for you thoughts. They are appreciated. When a scenario with factors such as you mentioned muck up clarity, I sit out until I see a strong trendline. When I am sure of the risk/reward and the existence of the trendline, I trade option contracts in the range that I would expect to see in the trendline. Long story short, I stay out until I see the direction of the market. On the side though, I keep front-month VIX Call option contracts that are far far far away from the strike price open, and just let time decay eat away the value against the buyer. I do this because I do not expect a black swan event in the near future. I could also sell far out of the money VIX Put contracts as well; but they do are not worth as much; however, it would be like free money; and selling far out of the mony VIX puts, especially when you expect the market to trend down, will earn you some coin without the risk of a black swan. Hourly H and S patterns on charts. RUT has a heck of a megaphone.... PL what's up with all this? Now here is a really good looking H&S bottom. Went right over my aluminum foil frannybrd.....thanks for pointing that out to me. I love the way CVX trades....specialist must be an x-engineer. He's a numbers guy! Does 3M suggest a rally to the old high at $98......is one of the Dow components. One of my rules is not to hold a position unless it is very clear in my charts from 3:30 to 4 pm. Lots of cross currents during that time. . .
hope ST traders put a TL on any ST trade and got out on any break, read below what I said about 3;30 to 4 pm. . . FYI.....I know Nenner is/was expecting unemployment numbers to again head higher starting in April. FWIW. Speaking of Head and Shoulders, is that one on the daily chart of CVX? I've got the left shoulder at Jan. 3, the head at March 14, and the right shoulder possibly yesterday. INDU 4 th lowest volume day in a year, 99.2Million. Has been dropping steadily since 13 march (163M) particularly the last 8 trading days. Not typical of a strong market. A possibility for sure....I believe PL has mentioned that in either his last post or the one before that. Here's an interesting twist.....let's say CVX price declines to $105 now. There is a neckline at $108.79 and a bottom price of $100.51.....H&S? Can you post the details of your 80 >> 120 concept? I know you've outlined it before, but I failed to archive it. Sorry if I've missed it recently. I see what you mean ... seems like anything is a possibility these days. Can you view MMM via your itchy eyes please? Appears to have formed a H&S bottom back in October, has risen above the neckline and appears ready (timing is everything) to rally towards $98. Your valued analysis please. Needless to say it's interesting beyond belief. I don't think any of you will be surprised by what you'll see though. Smashing good doctor.....pip pip, cheerio! More interesting to me is the back-test of the double-resistance, converging trendlines. Kiss goodbye? Regarding CVX: More interesting to me than the possible H&S is the back-test of the double-resistance, converging trendlines. Kiss goodbye? Here is what I said about 6 hours ago right at the bottom when I posted this chart [below], my 5 min. ES predictive count with the tgts on the chart. I initially thought it was gunna break the 90 area, but one has to stay nimble in this mrkt and not too convinced that this or that will happen and be willing to read the sign posts. This mrkt has been the toughest I have ever traded and I am sure PL will agree. And here is the results, the above yellow rectangle is what was predicted including that failed EW5 attempt (so far that is, future Globex and tomorrow might change this). I am not an EW salesman and this is purely pedagogic. But I am quite frankly always surprised and amazed [thank you Ralph, hats off to a brilliant and clairvoyant individual] at how accurate this can be as a form of predicting future mrkt movements. I chuckle when the bashers show up, wondering what they have to offer. I find nothing working at this point for LT predictions tho, we need some sort of channel we can use and evaluate. Bollinger Band Breakout, it usually travels to the opposite Bollinger Band. Yes...very slow. I think the buyers today were the last remaining widows and orphans. There is timing factor to this, this action cannot start too late in the day. Thank you so much for pointing all this out because I am learning watch. I finished one TA book and have moved onto Frost & Prechter. Breaking below $104.09 and I'll be short again. Until then, I'll watch from the peanut gallery. PL (or anyone else), I'd be interested in hearing your thoughts on RUT. This market seems typical of a top to me. A couple indexes make a small new high (INDU is up .2% over last 6 weeks) to give the appearance that the markets will only ever go up. At the same time other indexes are flat or down, breadth is poor, fundamentals are declining, etc. Detail: I was trying to post a reply with an image attached. I wonder if that has anything to do with it. Well, that "reply" seemed to work just fine without an attachment. Even Ron Paul's wearing the hat these days - hate it when I'm late on a trend! identical more or less to Indu B_E... hand in hand. Here is how you use stochs in an oscillating mrkt, still think that is what we are in. And fib. circles for No damn. How about this: get job as bank boss, get contract: big bonus if earnings/share goes up. Later, suggest to dozing board now fast asleep a share buy-back with surplus funds 'to increase shareholder value', result EPS goes up so bonus goes up. Magic. RBS are about to do this, 10 old for 1 new, imagine what THAT will do to his bonus... whew... Oddly enough this was illegal in the UK until recently... wonder why. Here's another, your bank bonds are trading at 50% face value. So buy them back thus reducing your outstanding debt. The value goes straight to the bottom line so your bonus goes up, even tho' the bank lost 1/2 the money... Magic. Bankers eh? What would we do without 'em. Bob, he told me privately that he would assure the mrkt would respect all EW rules and EWers would get rich. Now where did I put my 8 track audio player he said he was going to renew? Remember, the H&S palindrome was the terminus for the Three Peaks and Dome House pattern on the $RUT. Bob why would 104.09 be your entry price target? Just curious? Why not take a position near the top of the upcoming upward retracement and ride it safely downward? I am keeping a close look at CAT price movement. Thanks for the article. FYI 99.80 is the 4th & 13th week low for CAT. I'm not sure. About a week or 10 days ago Pretzel reported that he was having a difficult time on 'my' blog where the +image box took forever to load. I was having no issues with it. But 'here', about two or three days ago I was having the problem where the 'comment' box wouldn't open for perhaps 2 minutes. I asked if anybody else was having that issue but nobody responded so I'm not sure if it was affecting everybody or not. But I'm almost certain it's not 'site specific' but rather just another problem with glitchy Disqus. It really is a nuisance half the time but people like the way it threads comments and so far we haven't found a better alternative. Ironically, Disqus keeps sending emails inviting blog owners to try out the new 2012 version. Let's hope they've addressed some of the bug issues rather than just trying to make what they've already got 'prettier'. Unfortunately it looks to me like it's the latter. Thank you for your chart and insights. So do you mean that 4/23 terminated the 3P and DH pattern? Thanks katzo. Just looked it up. It did terminate at the 785.37 low. Thanks again. I appreciate all you do here. I thought 28 terminated at 10. What do you have for the price of 10? think you are talking about the smaller H&S, I am looking at the bigger one. Speaking of Stochastics, I've noticed that you use %R on some of your graphs and I was wondering if you've noticed any difference between that and Stochastics. They're all but identical under the hood excepts one compares the current bar's close to the highest high in the look-back period, the other uses the lowest low. no responsibility to the citizenry or to any elected officials. money dispensing helicopter hasn't dropped any money to me ... you ?? 'Quantitative Easing' should be called what it is -- money bailout for bankers. 'Zero interest rates' should be called what it is -- funding bailout for bankers. tribute to the King Bankers for the right to use the King’s currency. A man a plan a canal Panama. This is a great illustration, esp. with the circles. Have been staring at the moving Stochs and MACD under UVXY for weeks (it usually inverse mirrors the S&P) to learn how well those guideposts work. Thanks for your efforts here. Just finished reading Reminiscences of a Stock Operator by Edwin LeFevre. Couldn't put it down actually. It's amazing how much of it could easily have been written events of the last year, rather than a century ago. Probably a lot of people on this board have read it long since but a couple of paragraphs struck me as particularly worth sharing. ...There was no need to be perplexed into inactivity, for there were really no cross currents. I did not turn bearish on the market then, because the tape didn't tell me to do so. The end of the bull market had not come, though it was within hailing distance. Pending its arrival there was still bull money to be made. Such being the case, I merely turned bearish on the stocks which had stopped advancing and as the rest of the market had rising power behind it I both bought and sold. The leaders that had ceased to lead I sold. I put out a short line of five thousand shares in each of them; and then I went long of the new leaders. The stocks I was short of didn't do much, but my long stocks kept on rising. When finally these in turn ceased to advance I sold them out and went short five thousand shares of each. By this time I was more bearish than bullish, because obviously the next big money was going to be made on the down side. While I felt certain that the bear market had really begun before the bull market had really ended, I knew the time for being a rampant bear was not yet. There was no sense in being more royalist than the king; especially in being so too soon. The tape merely said that patrolling parties from the main bear army had dashed by. Time to get ready." INDU: off the wall thinking. This lot of waves is fiendish so looking to find a solution. TOP 13,400. Doc Nenner's target I believe. May well be totally wrong, but we'll see. strange. my fibinocci retracment shows between 61.8 and 50.
amazing as always. what made you think the fifth would fail? ive been following the 3pdh on the spx with ed carlson sure looks like the cupola is well formed and ready to go down. you mentioned 2 great analysts you follow. do you mind sharing? Mine are Ed Carlson, some guy named Katzo7, PL, and Tom Prindvale of the evil overlords intraday analysis. much better than STUand the long term stuff out of EWI. He's always treated me well overall, FWIW. Yeah, they wanted to have "exclusivity" -- so first I had to negotiate dual-publishing (my site and theirs). Then they wanted to have it published there first, and I could publish on a delay here. Problem is, it usually takes them 1-2 hours from the time I submit until it's actually published. I told them that wasn't fair to my forum readers, because it would mean that some days the articles wouldn't be up until after the market's open. I should add, though, that it would be helpful to me if you guys would visit Minyanville and "read" my articles "again" on the days that I publish there (this will be noted in the articles from now on, so you'll know which days). My pay there is based on the number of unique visits to my articles, and I promised to try to drive some traffic to their site in return for them letting me publish here without any delays. I think the wave 4 you mentioned in your last chart is of a higher degree that what you've shown. That's weird, Dow often leads. CMG is another POS I've had my eye on for a while. Nice chart. thnx PL, we need to watch it tomorrow, may have broken. Funny, KB03 said the same thing earlier this morning. One of my favorite sections in the book is where he talks about being able to see what's coming -- *and ending up being right* -- but being way too early acting on it. I can't remember the exact quote, and my book is boxed away somewhere, but I think that's an issue many bears have experienced. lol, I was thinking the same thing. You've obviously got a lot more experience at this than I do but when I see a sharp move like that I figure it's news and my instinct is to fade it. There are exceptions. Yesterday morning was notable in that the market spiked up on a some OK news and didn't give back the advance in an hour like it should have. Not to read too much into a single move but it me a little dubious of betting the ranch on short posistions just yet. I'll try to look at RUT tonight. It's possible, but I view that option as less likely. It doesn't seem to match many other things I'm seeing. All of that could always change, of course. LOL. I'm an idiot. I glanced at your chart with one eye on ES and totally thought you were talking about something else. Don't bother trying to make sense of my last comment. Obviously I have none. Its starting to look a lot like a diamond top. Don't see those very often, and the head portion of the pattern tends to be bifircated which hasn't happened yet but could. Failure point is usually midpoint of the contracting triangle from the rightside of the head to termination point in the right shoulder. But news pending could morph just as easily into an ascending triangle to new highs.... just gotta wait and see. 8 track??? ?...someone told you about those, right? You're not old enough to have actually owned one of those...I am and did! I'd say your between 37 and 42 years of age. Professional wife, 3 kids, 2 older girls (teens) and a son under 13. How'd I do? Yes, I loved that too. And I've already found in my own short career at this that that being right too early is effectively the same as being wrong.